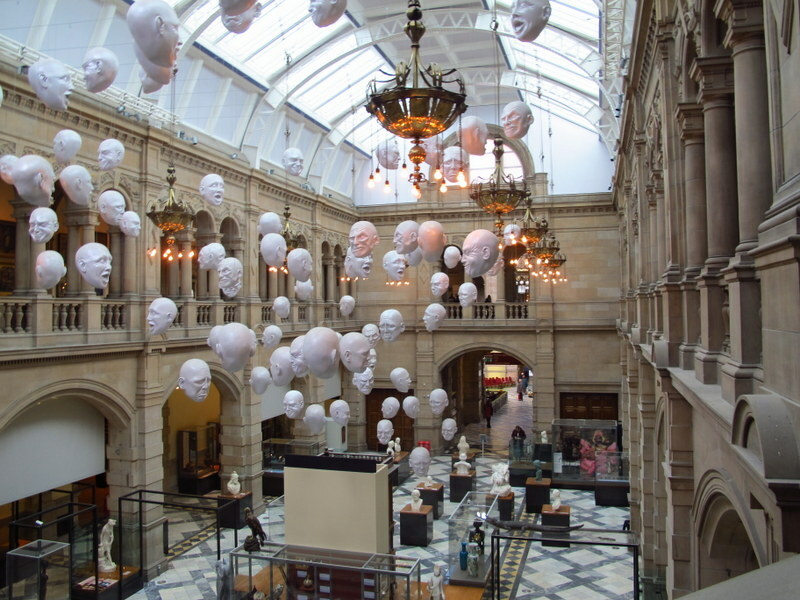 First port of call today was the Kelvingrove Art Gallery and Museum – I walked there, only went a tiny bit out of my way and was still early, wonders will never cease!! Once again the building held more allure for me than anything else , until I went inside and found what a treasure trove they have. It is truly amazing, and, guess what? It’s free!! There’s a huge range of exhibits, a Spitfire hanging from the ceiling, a whale somewhere else and a massive amount of beautiful sculptures and art. I really had a wonderful time there and saw my first live Salvadore Dali, the painting ‘Christ of St John of the Cross’. It sort of feels a bit strange to mention that one – I’ve actually seen lots of ‘my first …….’ in galleries all over England since I got here, but this one made quite an impression, and I loved the preliminary sketch hanging in the same little space. I have a slight problem lately, I seem to have developed a very short attention span when visiting art galleries or museums. I used to joke about having a short attention span with my grandchildren, because I could hand them back, but now it’s for real. Seems like after a few hours my eyes glaze over and my brain just refuses to take in any more information – old age???? But, at Kelvingrove, I discovered Charles Rennie Mackintosh, a Glaswegian architect, interior designer from the late 18th early, 19th century, so I took myself off to the Glasgow School of Arts to find out more about him. 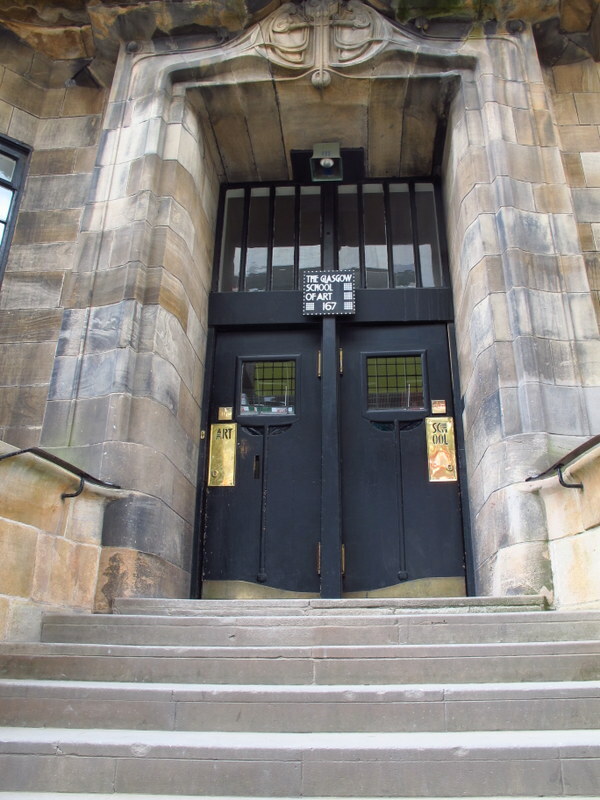 As luck would have it, the inside of the School of Arts is shut for two weeks in preparation for their annual open house or something so I had to be content with a walking tour around the building with a short visit to their gallery of original Mackintosh pieces. He designed everything about the School of Arts building, furniture, clocks, name plates, he even developed his own font – and it’s very cool. Did I say I became slightly obsessed with all things Charles Rennie Mackintosh? To continue my trail of discovery I went looking for the Willow Tea Rooms in the city, one of many tea rooms he designed for the owner Miss Catherine Cranston. An English woman got off the bus at the same stop, we happened to start talking and she was heading to the tea rooms for a look too, so we had afternoon tea together. It was funny, because we walked there together, sat together and then we both started to apologise and ask if the other minded, but of course I didn’t mind, it was like we’d known each other for years. She was in Glasgow with her grandson while he was a contestant on some game show, so while he was at the BBC all day she was out sight-seeing. We had a lovely time, I had a vanilla flavoured tea and a piece of sponge cake – but their sponge cake is not like ours, it’s much heavier, but still nice. It was good to have someone sneaking photos with me for a change, I’m often not sure if photos are allowed or not. After a little snoop in the other rooms we parted company and I ended up down in the shopping district listening to some wild looking Scottish band busking in the mall – and I must be going crazy, I bought one of their CD’s, still, it was a bit of light relief! 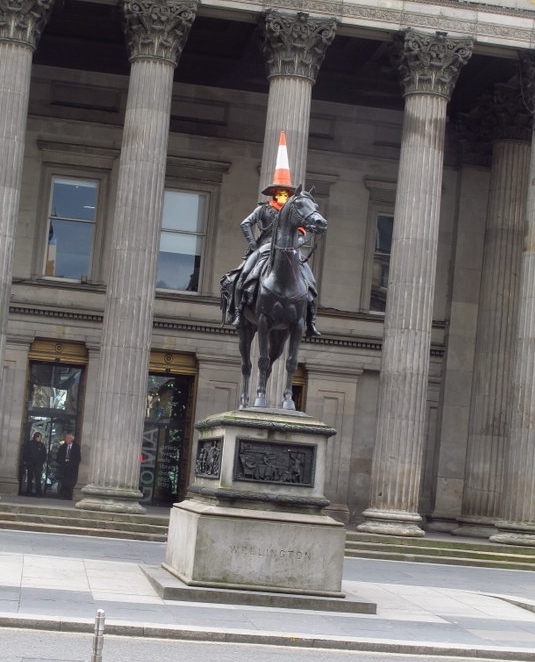 The guy riding a horse and wearing an orange traffic cone was beckoning me, so the Gallery of Modern Art kept me off the streets next. I still don’t get some of the modern art installations but I can usually find things to appreciate in most of them these days – still with some shaking of the head and frowning, but, hey, I figure that’s an improvement. I was absolutely had it by the time I left there so caught the hop on hop off bus back to my hotel. There weren’t many on the bus and a family had asked for the ghoulish commentary, very entertaining. It just amazes me how these guides keep talking and how they remember all the stories, I was fascinated but half an hour later can’t remember any of it, oh bugger, must be that old age thing again. Not very good pic, but the windows are lined with old sewing machines. Without my photos I’d have no blog!! Howdy, Julie….. love the Forking Great Food window sign. We didn’t see much of Glasgow because of time restraints and that tyre which needed fixing. Well, bonnie lass, we have now reached Wonga Beach near The Daintree. We have peacocks walking around our van and tropical paradise to sit in. Think the Election date will be announced this w’end. Sep 20ish, I think. Yeah, couldn’t resist putting that one in. The Daintree sounds like much better weather than Dalby at the moment then, hope you’re both enjoying it still. That should make the last game a good one to watch. I’m please to be over here and not having to listen to all the politics for a change too. Hugs to you both.